San Francisco Crystal Fair, March 9-10. 2019! From the East Bay: Take the Bay Bridge to the Fremont St. exit; exit and go right onto Howard to Embarcadero and turn left; follow Embarcadero (about 2 miles) to Bay Street and turn left. Take Bay (about 2 miles) to Buchanan and turn right. Cross Marina Blvd., and make a sharp right into the Fort Mason Center parking lot. Building A is the first building on your left. From Marin: Take Hwy 101 across the Golden Gate Bridge and keep to the left to the end of the freeway which becomes Marina Blvd. Take Marina Blvd. to Buchanan, turn left and then an immediate sharp right into the Fort Mason Center parking lot. Building A is the first building on your left. From the Peninsula: Take Hwy 101 north to the 9th St. exit. Take 9th to Hayes and turn left. Take Hayes to Franklin and turn right. Follow Franklin to Bay Street and turn left; continue on Bay Street to Buchanan and turn right. Cross Marina Blvd., and make a sharp right into the Fort Mason Center parking lot. Building A is the first building on your left. 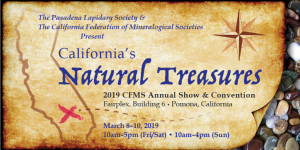 CFMS Annual Mineral Show in Pasadena, March 8-10! Organized in 1936, The California Federation of Mineralogical Societies (CFMS) was created to bring about a closer association of Clubs and Societies devoted to the study of Earth Sciences and the practice of Lapidary Arts and Crafts in the Western part of the United States. Mountains, deserts, and the Pacific Ocean have endowed our state with uniquely rich geological resources – and a richly diverse history, with people coming from all over the world to mine, study, build, and make things of beauty. We celebrate them all. Educational displays, activities for kids, fine jewelry, and lapidary crafts – from stone pendants in colors chosen by Mother Earth to polished spheres like planets – you’ll find rock-related fun on all sides and demonstrators to show you how it’s all done. For the whole family, we’re sharing an exciting way to enjoy Nature through the rockhounding hobby. Don’t miss the Raffle! This year the Pasadena Lapidary Society will be hosting this annual event. Many of its club members and friends will be volunteering their time in an effort to put on an unforgettable show. Kanawha Rock & Gem Club Show and Sale! Save the Date! The collection and study of rocks, minerals, and fossils and the sharing of knowledge and expertise in these fields. The study and practice of lapidary and the sharing of knowledge and expertise in this and related fields. Annual Rock and Gem Show! Kanawha Rock & Gem Club welcomes visitors to come and visit the club and attend a meeting before committing to a membership! Cave House Museum of Mining and Geology Show of jewelry, gems, minerals, and fossils is September 28-29, 2019! Welcome to the Cave House Museum 2019 Jewelry, Gem, Mineral and Fossil Show and Sale!! Dates and Times: Saturday September 28, 2019 from 9-5 and Sunday September 29, 2019 from 9-4. Show setup begins at 2PM on Friday, September 27, 2019.
venue with heat and electricity and will be locked overnight. The facility has room for 24 booths. mining and the importance of geology in modern life. A new era began for Howe Caverns on April 19, 2007 when the 220 shareholders of Howe Caverns, Inc. sold the company to two local men, Charles M. Wright and Emil J. Galasso. Both men vowed to invest several million dollars in improvements to Howe Caverns over the coming years. 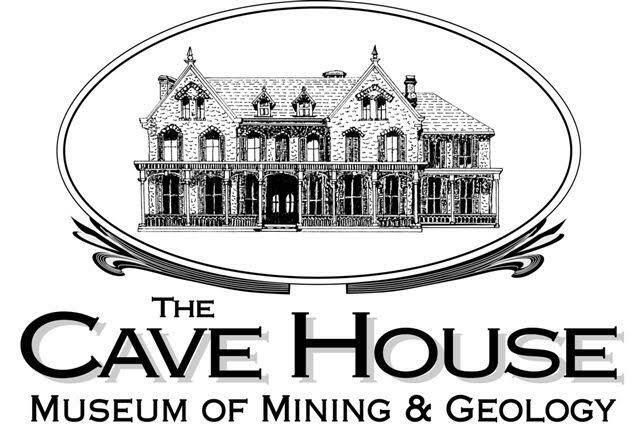 Mr. Galasso is also the founder of the Cave House Museum of Mining & Geology on the site of the original Howe’s Cave located on land adjacent to Howe Caverns. The vision for the future of these properties includes joining the present Howe Caverns to Lester Howe’s original cave on the site of the museum so that visitors may see the natural wonder as they did in the 19th century. The new owners continue to fulfill their vision for a renewed Howe Caverns to expand the tour beyond the current Lake of Venus. Eventually, this work will unite the entire cave system as it was found when Lester Howe discovered it in 1842. Walkways, lights and bridges will need to be installed. The 875 feet of cave destroyed by mining in the early 1900’s will need to be recreated. Since 2007, visitors can now view the Cave House Museum at various times during the year. If you would like more info on local Mineral shows and rockhound clubs click on our News page for up to date listings and links to Gem Show, Mineral Show, and Fossil Show announcements. We update our rockhound news twice an hour and showcase the top mineral shows and rockhound news in the USA and the World. Also, follow us on Twitter for even more rockhound events, commentary, and laughable quips from American Geode. Ventura Gem, Mineral, Fossil, Lapidary Show, March 2-3! 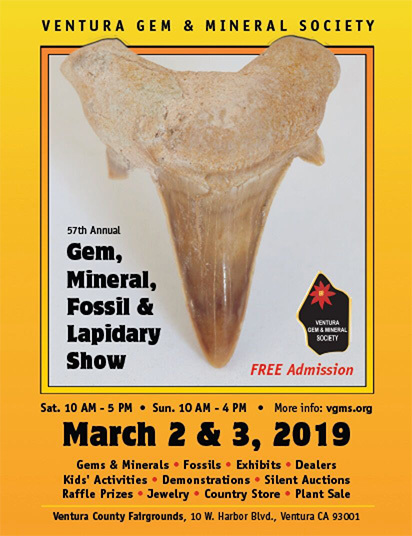 The 57th Annual Gem, Mineral, Fossil & Lapidary Show of the Ventura Gem & Mineral Society (VGMS) takes place March 2–3 (10AM—5PM, Saturday; 10AM—4PM, Sunday) at the Ventura County Fairgrounds (10 W. Harbor Blvd, Ventura, CA). The show is open to the public and admission is free, although the Fairgrounds charges a parking fee if using the Fairgrounds lot. There’s gold in them thar hills, and you can learn how to pan for it at the 57th Annual Show of the Ventura Gem & Mineral Society. At one booth, expert prospectors will guide you through the steps of gold panning, and you can purchase “pay dirt” to pan for real gold in your own backyard. You’ll also see displays that include meteorites, handcrafted jewelry, and “Auggie”, the California State Dinosaur. With a focus on kids and education, on gemstone cutting and jewelry-making, and on rocks and fossils, the Ventura Gem and Lapidary Show has been a fun family event for 57 years. During our pre-show dinner on Friday, March 1, we will present a $1,000 Scholarship to geology student Diana Valentino of Santa Barbara City College. The next day on entering the show, kids will be given a free polished stone at our Welcome Booth, where we will have free rock samples and educational packets for teachers. At the Kids Booth, children will enjoy activities offering an assortment of rocky prizes. A display nearby will offer information about the society’s two-room museum in Ojai, where teachers, home-schoolers, and Scouts can arrange tours by appointment. This free lapidary show will feature 60 displays of gems, minerals, meteorites, fossils, and award-winning handcrafted jewelry. Among these will be educational exhibits of fossils collected locally in and around Ventura County, as well as a display of our State Rock, Mineral, Fossil, and Gemstone (including a gold nugget and Ice Age saber-tooth cat). Still other displays will show how stones collected locally have been crafted into jewelry. Demonstrations throughout the show will give visitors up-close looks at artists pursuing their skills, including gemstone cutting, silver work and jewelry making, beading, and other arts. Raffle prizes include fine jewelry, a $100 bill, mineral and fossil specimens, and more. Also part of the festivities are hourly silent auctions for rocks, minerals, and fossils, as well as a white elephant sale, plant sale, and over 15 dealers selling beads, opals, jade, gemstones, crystals, fossils, jewelry and jewelry-making supplies, and gift items. It’s a Ventura tradition the whole family can enjoy! VGMS was founded in 1944 to encourage interest in rocks, minerals, fossils, jewelry-making, and related areas through education, activities, and exhibitions such as this annual show, which is open to the community. The society is a 501(c)(3) nonprofit, educational organization and welcomes individual and family members. VGMS hosts monthly talks on earth science topics and lapidary arts, makes presentations to area schools, and conducts field trips for members and guests that often involve collecting rocks, minerals, and fossils in southern California and neighboring states. The show is the society’s major fund-raising event helping to underwrite educational activities, including the annual college scholarship.